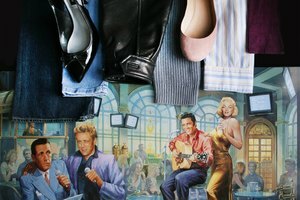 The free-flowing hippie fashion of the 1970s reflected the youth culture's response to the strict mores and conservative values of the 1950s and 1960s. Defined by their carefree and laid-back attitude, hippies adopted a more eclectic, leisurely style that symbolized peace, love and equality for all. Entertainers like Jimi Hendrix, The Beatles, Jefferson Airplane and Cher popularized hippie fashions that blended ethnic garments, colorful patterns and loose-fitting clothing. All this made the hippie look one of the most recognizable trends of the 1970s. Hippie women often wore loose-fitting and leisurely garments like kaftans, flower child peasant tops, maxi dresses and bell bottoms. This represented a shift from the more tailored, formal A-line dresses of the 1960s. It also made a change in popular fabrics; the advent of central heating in homes and cars made the use of lighter clothing materials a necessity. Full-length wool coats could now be replaced with velvet or velour jackets and raincoats. Flowing fabrics grew in popularity as well. Light cotton, voile, chiffon, viscose rayon and brushed materials became standards of the era. For the first time, in the 1960s and 1970s, travel abroad became accessible to the masses through commercial airlines. Many Westerners were able to visit faraway locations and bring with them garments, inspiration and fabrics previously unseen. 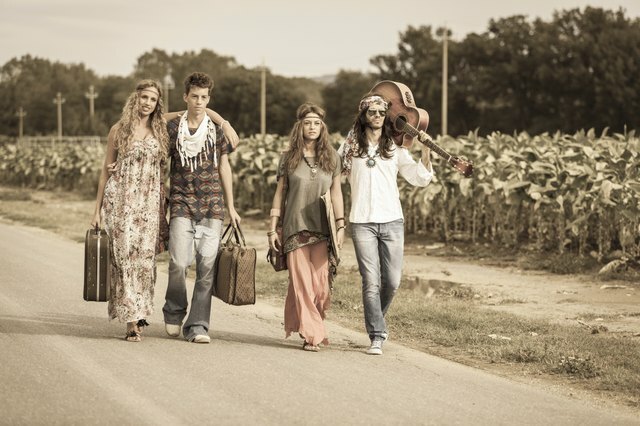 Hippie style began to incorporate foreign influences and pieces. The caftans, kimonos, muumuus, djellabas and Nehru jackets of India, Africa and Asia became the inspiration for at-home comfort robes and light jackets that would become fashion staples of the era. 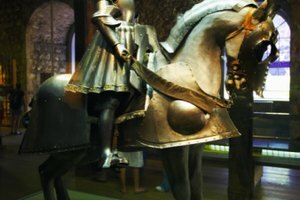 Often these garments were reinterpreted to have decadent and ostentatious details like gold metallic trimming or sequins. The hippie movement promoted personal expression, doing away with gender norms and supporting equality for all. Men wore their hair long and untamed, often with sideburns. 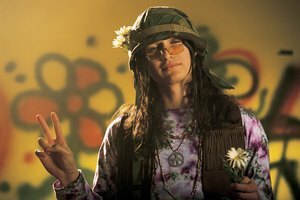 Compared to the manicured, short and waxed haircuts of previous generations, hippie men were perceived as more feminine. Women redefined what was acceptable by sporting varying hemlines ranging from long maxi skirts to short mini skirts. Flowers and floral prints were worn as a symbol of peace and love. 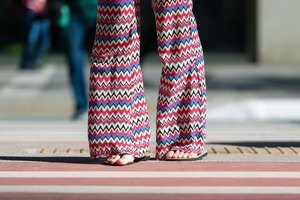 Bell-bottoms, tunics, tie-dye, fringe, body paint, piercings and tattoos all served as a vibrant and eclectic way for baby boomers to distinctly separate themselves from the more conservative images and norms of the past. Platform shoes were a staple of the 1970s. The shoes ranged in height from a quarter to 4 inches and were characterized by their thick, high and flat soles. Due to the perceived danger of such high platforms, many opted for clogs to capture the spirit of the chunky style while staying more grounded. The popular jewelry of the time was inspired by nature or handmade Native American designs. Necklaces featured beads, peace signs, flowers, pendants and bells. Friendship bracelets also became popular. The woven bracelets made with colorful yarn were easy to replicate and share. Hair accessories included printed bandanas, thin headbands and flower crowns.